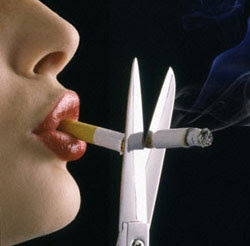 Quit Smoking and feel the change:- Lifestyle Fundas : Career and Education | Fashion and Life Style | Latest Trends | Travel Guide | Love and Relationships | Latest Technology | Health Care | Beauty TipsLifestyle Fundas..
• After 20 MINUTES Blood pressure/pulse rate and body temperature drops back down to normal stage. • After 8 HOURS Carbon monoxide level decreases & Oxygen level increases in blood. • After 24 HOURS Chance of heart attack decreases up to minimum. • After 48 HOURS Nerve endings start re growing and ability to smell & taste is improved. • After 2 WEEKS TO 3 MONTHS Circulation of blood improves which results in easier Walking and lung function increment up to 30%. • After 1 TO 9 MONTHS coughing, sinus congestion, fatigue, and shortness of breath decrease. Cilia re grow in lungs, increasing ability to handle mucus, clean the lungs, and reduce infection. Body's overall energy increases. • After1 YEAR Excess risk of coronary heart disease will decrease as that of a nonsmoker. • After 5 YEARS Lung cancer death rate for average smoker (one pack a day) decreases by almost half. Stroke risk is reduced to that of a nonsmoker 5-15 years after quitting. Risk of cancer of the mouth, throat and esophagus is half that of a smoker's. • After 10 YEARS Lung cancer death rate similar to that of nonsmokers. Precancerous cells are replaced. Risk of cancer of the mouth, throat, esophagus, bladder, kidney and pancreas decreases. • After 15 YEARS Risk of coronary heart disease will decrease as that of a nonsmoker.